Once I sort of got a picture in my head, it went together pretty quickly. I started by SNAILing a piece of Whisper White card stock to a Tranquil Tide mat for the card front. The bottom square of my stack is a piece of the Dapper Denim paper in the Color Theory DSP Stack, cut with a Stitched Shapes square die and matted on a scalloped edge Tranquil Tide square, cut with the Squares Layering Framelits. It’s SNAILd to the card front. For the angled panel, I stamped the floral background image in the Background Bits stamp set in Tranquil Tide twice on a piece of Whisper White and then cut it out with my trimmer. I sponged the edges in Dapper Denim and then adhered it over the layered square with Liquid Glue. I stamped the single flower image from Background Bits twice in Basic Black Archival Ink on another piece of Dapper Denim paper from the Color Theory DSP Stack and then cut it with a Stitched Shapes circle die. I used a little Liquid Glue to adhere it to a Tranquil Tide scalloped circle and then popped it over the layers with Stampin’ Dimensionals. The final layer is my sentiment. I inked the sentiment from Background Bits in Versamark and stamped it on a piece of the same paper as my art circle. I sprinkled it with White Stampin’ Emboss Powder and heated it up. I snipped one end in a banner and then, to mimic a mat, I sponged the edges of the banner with Dapper Denim. It’s adhered with Liquid Glue. I added a few Pearl Basic Jewel Embellishments and the card front was done! On the inside, I used my Stamp-A-Ma-Jig to stamp a second sentiment from Background Bits in Dapper Denim on a piece of Whisper White card stock. Across the bottom, I stamped the multiple flower image in Basic Black Archival Ink. Then I used my Dapper Denim Stampin’ Write Marker to color in the white accents in the flowers. I SNAILd the panel to a Tranquil Tide mat and into my Basic Black card base, popped the card front on with Stampin’ Dimensionals and the card was done! …and then I added more of the Dapper Denim Color Theory DSP to the envelope flap. Et Voila! It took me a minute to come up with an idea, but once I got rolling…I really like how clean and simple it turned out. Background Bits is a lovely little stamp set – available exclusively with Stampin’ Rewards! Hope you like! The Background Bits stamp set and Color Theory DSP will be available on 1 June! Tranquil Tide ink and card stock is available right now in the Premium Eastern Palace Bundle! The whole team did a fantastic job interpreting the sketch and everyone’s was unique. Loved hopping today. I have my eye on that host stamp set. It was a great hop for sure! And so is this host set!! Thanks, Karen! So pretty! 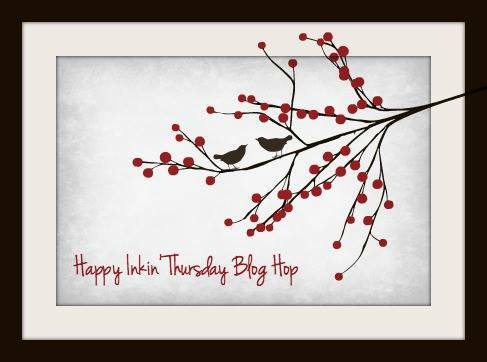 What a great blog hop! I’m so glad to have so many great examples with this stamp set now, lol!